New York: Elon Musk may be starting to put those take-private tweets behind him, but his fortune will need more time to recover. The net worth of the Tesla Inc. chief executive officer stood at $24.4 billion on the Bloomberg Billionaires Index the day before he publicized his ambition to take the company private at $420 a share. 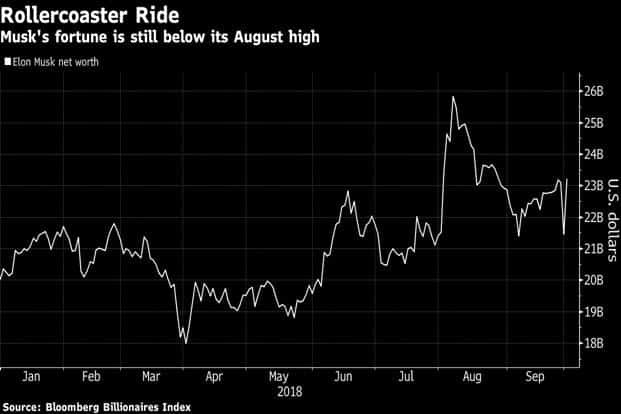 His wealth spiked by $1.4 billion on the day of his tweets, then fell to $21.4 billion within a month, after he abandoned the buyout effort without ever making a formal proposal to his board. News of Musk’s settlement with the Securities and Exchange Commission—which allowed him to keep calling the shots as CEO—reassured investors Monday, sending the shares and his wealth higher again. Musk, 47, finished the day $1.7 billion richer, with a $23.2 billion fortune. That still leaves his net worth $1.2 billion less than before all that tweeting about going private.